The controversy arises from several factors. The experiments involve creating and then destroying human embryos for research purposes, which some find morally repugnant. The scientists also used cloning techniques, which raise concerns that the research could lead to the cloning of people. Ever since human embryonic stem cells were discovered, scientists have had high hopes for them because the cells can morph into any kind of cell in the body. That ability means, in theory, that they could be used eventually to treat all sorts of illnesses, including diabetes, Alzheimer’s, Parkinson’s and spinal cord injuries. So for years, scientists have been trying to use cloning techniques to make embryonic stem cells that are essentially a genetic match for patients. The idea is that such a close match would prevent their bodies from rejecting the cells. “It’s been a holy grail that we’ve been after for years,” says , a stem cell pioneer at the University of Pennsylvania. But every previous attempt ended in failure or fraud, leading many scientists to wonder if the goal might be impossible to reach. Scientists report Wednesday that they have successfully cloned human embryos from a person’s skin cells. Here’s how they could eventually use the technology to create new therapies for a patient. However, of the Oregon Health & Science University and his colleagues never gave up. They succeeded in mice and monkeys. And in this week’s issue of the journal Cell, Mitalipov’s team they finally did it in humans. The researchers first recruited women who were willing to provide eggs for the research. Next, they removed most of the DNA from each egg and replaced the genetic material with DNA from other peoples’ skin cells. Then, after a long search, they finally found the best way to stimulate each egg so that it would develop into an embryo without the need to be fertilized with sperm. The key turned out to be a combination of chemicals and an electric pulse. “We had to find the perfect combination,” Mitalipov says. As it turned out, that perfect combination included something surprising: caffeine. 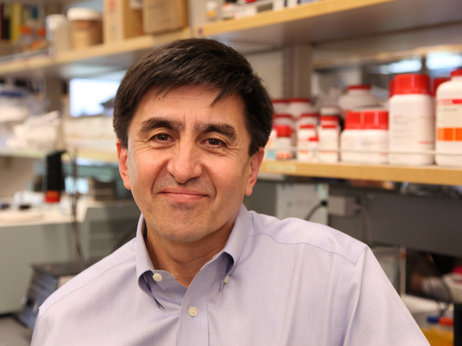 Shoukhrat Mitalipov, of Oregon Health & Science University, first cloned monkey embryos before trying his method on human eggs. That ingredient, plus other tweaks in the process, including using fresh eggs and determining the optimal stage of each egg’s development, Mitalipov says. The researchers showed that the resulting embryos could develop to a stage where they could produce healthy stem cells containing the genes from the skin cells. They even showed that the stem cells could be turned into other types of cells, including heart cells that in a laboratory dish could pulse like a beating heart. The work drew immediate criticism because of ethical concerns. First of all, the Oregon researchers compensated women financially to donate eggs for the experiments — something many in the field have considered ethically questionable. But beyond that, the creation and destruction of a human embryo is morally repugnant to people who believe an embryo has the same moral standing as a human being. Moreover, Mitalipov used the same method that researchers used previously to clone . 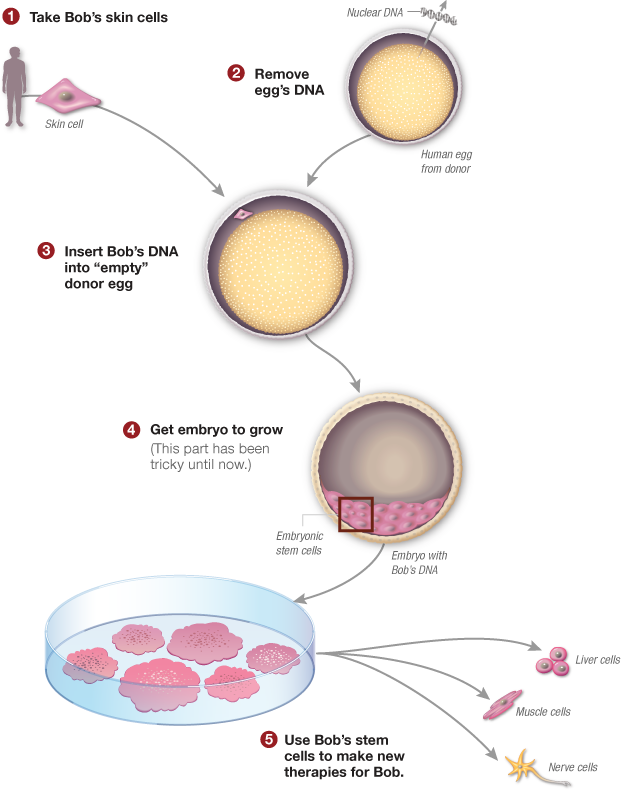 That approach raises the possibility that scientists could try to clone a human being. But Mitalipov dismisses those concerns. He says the embryos he created aren’t the equivalent of a human being because they weren’t fertilized naturally. And his experiments with monkeys indicate that it’s unlikely that they could ever develop into a healthy baby. “The procedures we developed actually are very efficient to make stem cells, but it’s unlikely that this will be very useful for kind of reproductive cloning,” Mitalipov says. Other researchers agree with him and argue that the possible benefits of the research outweigh the concerns. “Where you can improve [a patient’s] quality of life tremendously through this kind of technology, I personally believe that it is ethical to use material like this,” Gearhart says. The scientists acknowledge that it will be years before anyone knows whether this step will actually result in treatments that might help patients. In the meantime, it’s clear that the intense debate over embryonic stem cells is far from over.